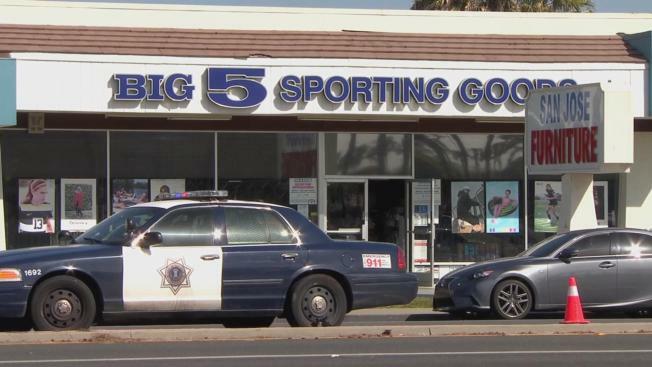 San Jose police on Sunday shot at a man who opened fire at three officers near the Eastridge Center, and then arrested him. No one was hurt, but the weekend's shootout marks the third officer-involved shooting in the South Bay city in the last seven days. Thom Jensen reports. San Jose police on Sunday shot at a man who opened fire at three officers near the Eastridge Center, and then arrested him. No one was hurt, but the weekend's shootout marks the third officer-involved shooting in the South Bay city in the last seven days, according to police. San Jose police on Sunday shot at a man who opened fire at three officers near the Eastridge Center, and then arrested him. Kris Sanchez reports. At a news conference late Sunday, police Chief Eddie Garcia denounced the suspect's display of violence. "I will say, the actions of this suspect were apalling, and the continued violence toward law enforcement officers is also equally apalling," he said. "We're very lucky we did not lose an officer today." The still unidentified man has been booked into Santa Clara County Main Jail and will be charged with three counts of attempted murder of a police officer and possession of a stolen firearm. The .45 caliber gun he was carrying was stolen in a 2013 burglary, Garcia said. A man was taken into custody Sunday morning after firing shots at officers in East San Jose, police said. Christie Smith reports. Police originally received reports around 8 a.m. about a suspicious person armed with a gun on the 2200 block of Tully Road near a Big 5 Sporting Goods store. Officers suspect he may have been casing the shop. When officers initially made contact with the man, he seemed cooperative. That changed, however, when they began giving him commands, Garcia said. The suspect then pulled a handgun out of his waistband and shot at them. At least one officer returned fire, but the man managed to run in the opposite direction, hop a fence and flee into a mobile home park, Garcia said. Officers set up a perimeter and managed to find the man roughly two hours later, according to police. He was taken into custody. The motive and circumstances leading up to the shooting are being investigated. Police are also looking into whether the man was involved in the burglary during which the weapon he was carrying was stolen. Local law enforcement agencies are familiar with the suspect, who may have been a transient, Garcia said. He has a history of mental illness and has priors of robbery, assault and narcotics. The officer who returned fire has been a policeman for 16 years. He will be placed on routine paid administrative leave while an investigation is conducted, police said. All responding officers were wearing body-worn cameras, Garcia said. 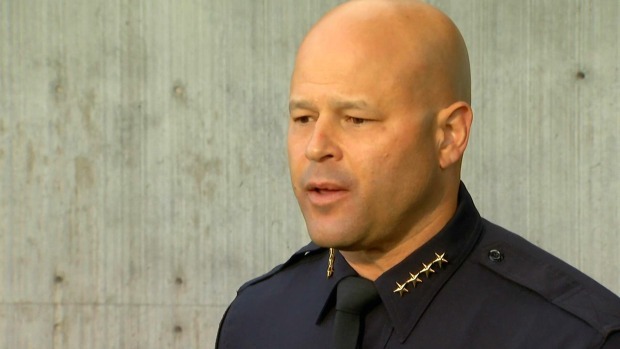 Garcia commended San Jose police officers who "once again stood tall in the face of grave danger, maintained composure after their lives were threatened." They "did not back down and safely apprehended a violent individual who undoubtedly would have otherwise continued to terrorize our community," he stressed. San Jose police on Wednesday night shot and killed a 24-year-old man after he gunned down his ex-girlfriend's parents in their Willow Glen home, and then pointed his firearm at officers through a window. The night before, police shot and killed a man when responding to a family altercation in East San Jose. He charged toward officers clutching two kitchen knives, one of which was raised over his head. It is mandatory for San Jose police officers to undergo crisis intervention training, but, Garcia noted, the program can't "really, truly assist in these types of situations where these individuals have immediately taken the fight to the officers." "Absolutely, its weighing on the psyche of our officers,” he added. “Our officers have been attacked by individuals. This is another example." The San Jose Police Department has long been plagued by understaffing. Recently, it began to bolster its numbers, but this is the third police officer who, due to his involvement in an officer-involved shooting, has been temporarily taken off the streets. "We're stretched thin, there's no doubt about it," Garcia said. "This department is stablizing and we are growing again, but we are definitely not out of the woods with regards to staffing yet. So, yeah, we’re stretched thin." Considering the hostility they are working amidst, it's imperative for police officers to remain vigilante and support each other, Garcia added. "Incidents like this are an example to every police department in this country, quite frankly, that our officers need to be on watch," he stressed. The San Jose Police Department will handle the investigation and the Santa Clara County District Attorney’s Office will review their findings once its complete. It is not a joint investigation because no one was hurt, Garcia said. The case is being monitored by the San Jose Police Department's Internal Affairs Unit, the City Attorney’s Office, and the Office of the Independent Police Auditor. Santa Clara Valley Transportation Authority bus lines 12, 22, 26 and 70 between King and Quimby roads were rerouted to avoid the area during the incident, according to the transportation agency. 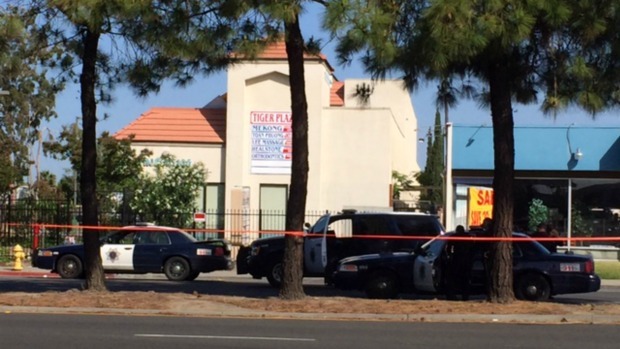 Anyone with information regarding the shooting is asked to contact the San Jose Police Department's Homicide Unit at 408-277-5283.